Looking at Earth from Space, the Middle East, Africa, Asia and Europe all come together in the Mediterranean, literally meaning ""the Middle Earth. ""The immense liquid entity of the Mediterranean Sea has blended these different cultures for millennia, and Turkey, situated at the Eastern Mediterranean, has long been a geographical and cultural crossroads. So it is fitting that on Alif such a world class musician as Omar Faruk Tekbilek would serve as a transdimensional ship, traveling from port to port, history to future, style to style, sharing his immense gifts and reminding us that art is a glimpse of the Divine. For perhaps more than any other art, music supercedes social differences by showing the similarities in humanity.Musical notes don't represent nationality, but rather express emotionality. 1 - DULGER: This is a Sufi song in folkloric style from Eastern Anatolia in Turkey. Dulger (the Architect) has created the House of the Universe, a beautiful place with a strong foundation that accommodates many different types of people, setting an example of living harmoniously. ""Life is sweeter than honey. But, what a pity! The sad thing about human nature is that some people put salt into honey."" 2 - GARDENER: This is a Sufi love song in the Achiklama style of Eastern Anatolia in Turkey. The lover of God enters into the Garden. However, neither the Garden nor the Gardener realize his presence and there he finds his spiritual union and reaches ultimate wisdom. 3 - LAUNDRY GIRL: A traditional Rom (Gypsy) love song in 9/8 tempo. Additional Persian vocals express the common root of Middle Eastern cultures. 4 - DARK EYES: This is a contemporary composition sung in a traditional Bulgarian style. A lover's sleep is disturbed by a dream of the black eyes of a beautiful woman he wishes to marry. 5 - SHINANAY: This is a popular Turkish and Greek folk song with an irresistible lattice melody about passionate love between two lovers. 6 - DON'T CRY MY LOVE: This is a folk song from the Middle Anatolia in Turkey. The lover is crying for his beloved to come to him before he dies. 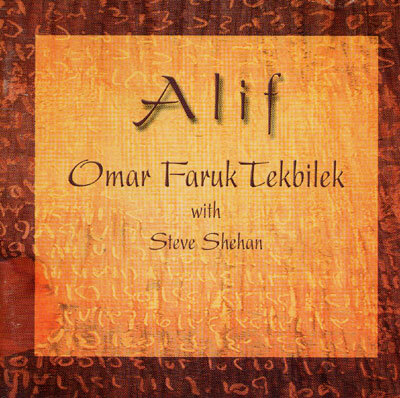 7 - ALIF: This song is a medley of Sufi compositions from Turkey. Alif (God) is the beginning and the end of all creation, the source of all happiness. The lover's devotional calling for union with Alif finds himself in the flakes of snow, the smell of flowers and, like the heavenly bodies, everywhere he turns. 8 - DADASH: This song is an instrumental medley of Eastern Anatolian folk compositions in a lively 6/8 tempo. 9 - TAKE A FLIGHT: This is a contemporary composition in the Hijaz makam (mode), a very characteristic scale of Middle Eastern music. 10 - YA BOUY: This is an instrumental arrangement of a famous song written by Egyptian composer Farid-al Atrash, here energetically transformed for belly dancers. 11 - LACHIN:This is a love song from Azerbaijan (northwest Persia). A lover's longing for his beloved streams like the Aras River, constantly flowing towards its ultimate destination, the ocean. ""It runs for miles and miles filled with roses... He wishes to die with the sight of his lover in his eyes."" 12 - FORBIDDEN LOVE:This is a contemporary arrangement of a well-known Israeli song. The song reminisces a past love, and is arranged in classical Middle Eastern style.